No-Hole Sheet Protectors offer the durability of traditional heavyweight sheet protectors, but without the three-hole punched binding strip. No-Hole Sheet Protectors offer the extra document storage durability of traditional heavyweight sheet protectors, but without the three-hole punched binding strip. Use by themselves to post signs or protect frequently-used materials, or to subdivide files and folders. Acid-free polypropylene means no photocopy transfer. For 11 x 8 1/2 documents. Clear. 25/BX. Hi, I'm Griffin at C-Line. And today we're going to talk about our No-Hole Sheet Protectors. 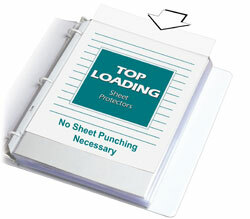 No-Hole Sheet Protectors are like traditional sheet protectors without the 3-hole punched binding strip. These heavyweight sheet protectors are made from acid-free polypropylene and provide durable storage for materials that don't need to go in a binder. The clear finish on these sheet protectors offers a sharp, transparent view of the contents and makes them ideal for storing documents or posting signs. They can also be used to protect important papers, photos, recipes, appliance manuals, and more. And they fit nicely into file folders. They are packaged in an easy open, reclosable box, which is handy for storage and keeps them clean and protected. C-Line No-Hole Sheet Protectors store and protect materials in their original condition. They are great for organizing your home, school, or business. Order yours now! That's all we have for today. I'm Griffin at C-Line, and thanks for watching.